Every other month Director Tom Bowden brings the team together to compete in the Footprint Digital Apprentice Challenge. This year the Footprint Digital team has split into two teams: The Powerpuff Girls and The Michael Scanlon Jazz Band Experience. Having completed round one, the score stands at 1-0 to Michael Scanlon’s Jazz Band. This is the account of how challenge 2 went for the teams. To the winners…glory. To the losers… you’re fired! As the second apprentice challenge dawned on the Footprint Digital team, first-round rivalries that were sworn to the grave resurfaced and revved their engines. This round would see the Power Puff Girls pit their go-karting capabilities against the in-form Micheal Scanlon Jazz Band Experience. After last round ’s win, they were ready to lengthen the gap to 2-0. 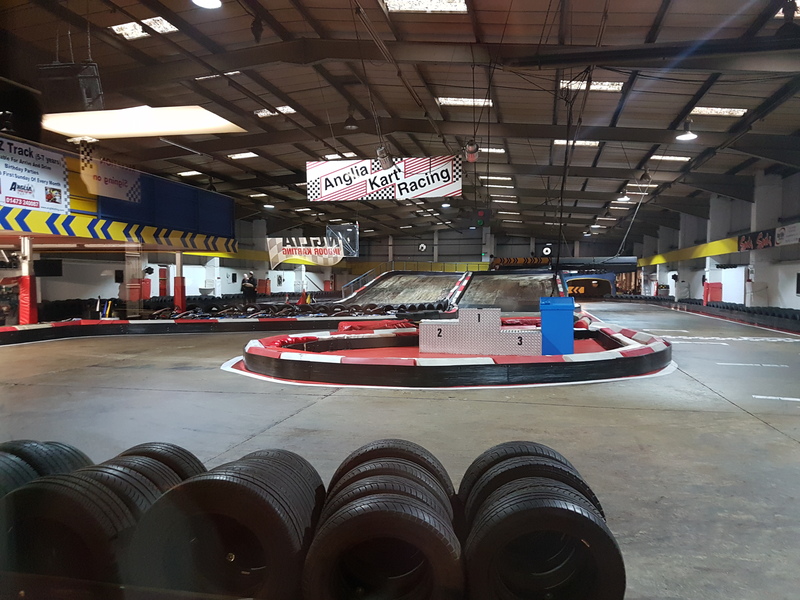 The venue: Anglia Indoor Kart Racing, the goal: get around the track quicker than your opponents, at all costs. The teams arrived in good spirits, hyped up and ready to put the pedal to the metal. Having changed into their racing balaclavas, outfits and helmets, they ascended to the briefing room to absorb the rules and regulations. Through the form of a video, they watched a mostly convincing male and female duo wave different coloured flags and drive around the track. Then, the video was turned off, and we had a recap of the rules and each flag; this time demonstrated by a real version of the man on the video. Having taken everything he said into consideration, it was go-time. After every racer had undertaken a few warm-up laps, the reckless endangerment, I mean competition, began. Each lap saw some team members treating the race more like an extended version of bumper-karts. Thus, the competitive nature of the digital marketers turned pro-racers started. The team exercise was quick to dissolve into an every-person-for-themselves activity. Power Puff Girls were barging and overtaking Power Puff Girls and their opponents were no better. In fact, it wasn’t until all the qualifiers came to a close, with back injuries sustained, that everyone stopped for a sudden realisation. The final was evenly matched, the team members equally split, and this was an apprentice team challenge! The final was edge-of-your-seat stuff, and not only because Tom Bowden bashed anything he could get his front bumper on. After a hard fought 12 laps… The winners emerged. It was a resounding victory for the Power Puff Girls. Two of their team stood on the podium taking 1st and 2nd place. Congratulations to MoveItMeadows taking 1st and Speedy Gonzalreub in 2nd. Micheal Scanlon’s Jazz band experience got a mention in 3rd with XebecRacing, but it wasn’t enough. Thus, the apprentice challenges were all tied. The team were eager for the opportunity to outdo one another yet again. Haven’t read about round three yet? The tension mounts. Do you want to work in an environment where you are supported to do the best work of your career? Please check out what it is like to work at Footprint Digital and contact us to apply for a role.